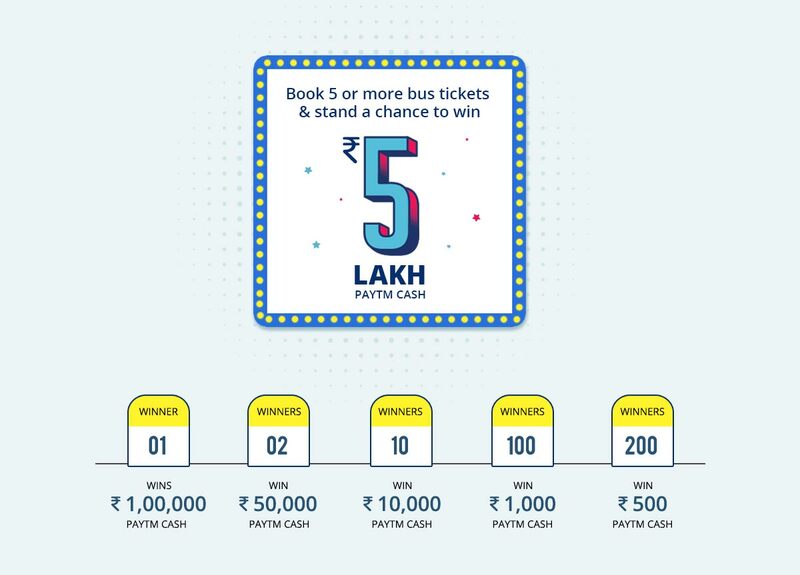 Users are also eligible to get an additional Paytm bus Cashback voucher of ₹50 on every 5th bus ticket booking, after completion of the journey(maximum up to 20 successful bus tickets booking) during the offer period. The offer is valid from 11th April, 2018 to 30th June, 2018. This Offer is sponsored, organized and administered by One97 Communications Limited,a company which owns and operates an online marketplace on the website located at the URL ‘www.paytm.com’ and ‘Paytm Mobile Application’, Paytm IVR and Paytm WAP (hereinafter “Paytm Platform” or “Platform”) and is having its registered office at 1st Floor, Devika Tower, Nehru Place, New Delhi - 110019 and corporate office at B-121, Sector 5, NOIDA - 201301, Uttar Pradesh, India. For clarity and brevity One97 Communications Limited is hereinafter referred to as “Paytm”. *Disclaimer: Paytm cash is a semi closed payment instrument and may be used for the purchase of third party products or may be transferred to the person’s bank account.